This web site is maintained by Jeff Squyres, the author of the MPI Mechanic column of the now-defunct ClusterWorld magazine. Its purpose is to provide all the back issues of the column. 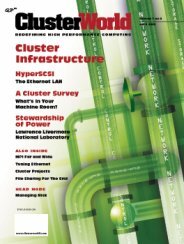 Since ClusterWorld magazine has merged with Linux Magazine, the MPI Mechanic column is effectively no more. So sad. However, MPI Mechanic has been replaced by MPI Monkey on the Cluster Monkey web site. All these old columns will be appearing there, along with new content. Woo hoo! If you can't wait for the content to appear on Cluster Monkey, you can download PDFs of the old MPI Mechanic columns here. I ask that you do not redistribute the PDFs found on this site; they are (and will continue to be) free to download from here. Please direct anyone that wants copies of these columns to this web site: http://cw.squyres.com/. Thanks! The "MPI_ANY_SOURCE" on line 3 of "the following may be more appropriate" solution code should be "i+1". The "&status" argument should be eliminated on line 4 of the "Will the following code deadlock?" section. Apr 2005: Why Are There So Many MPI Implementations? Mar 2005: Is Your Application Spawnworthy? Dec 2004: MPI Debugging: Can You Hear Me Now? Jan 2004: Processes, Processors, and MPI, Oh My!